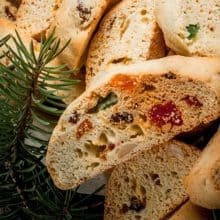 Delicious Christmas biscotti using candied cherries and fruit! Your choice of chocolate for dipping white was extremely tasty with this. Cream your butter and sugar, then add your eggs in. Once those are mixed, add in the almond flavoring. Whisk your flour, baking powder and salt together. Once those are mixed, add in your candied fruit. I used some mixed fruit (which has peels etc in it, nice and tangy!) plus some cherries chopped up. If you like them very fruity, use about 2 cups, I went with 1 and 1/2 cups and that was good for me. Refrigerate it for about an hour. Once the dough is cooled and firm from its hour in the fridge, split the dough into 4 equal pieces. Shape each half into a 12 inch long log, place on a baking sheet covered in parchment paper and flatten slightly. Bake in a 325 oven until browned, anywhere from 20-25 minutes, depending on your oven! Cool for about 5 minutes. Once they are done, let them cool, then dip them into chocolate, the top, the side, the bottom, whichever you want, drizzle with chocolate or leave them plain.